Select your main ingredient, then follow the grid for perfect pairings. That set of 47 herbs and spices you got from your well-meaning aunt isn't going to tell you its hopes and dreams. Let Stuart Gardiner's handy tea towel set be your seasoning sherpa through the bewildering world of flavors. Printed in herbaceous greens and autumnal tones, the pair of 100% cotton towels is an intuitive guide for the spice cabinet-shy but comprehensive enough to please even seasoned chefs. Simply select your main ingredient, then follow the grid for perfect pairings. 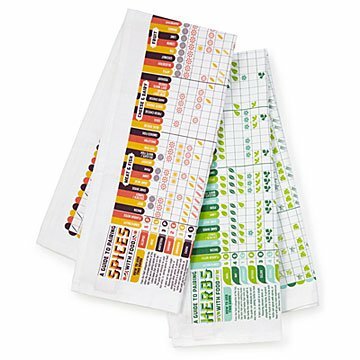 The towels also include freshness tips, cooking pointers, and storage advice to make the most of your herbs and spices, from allspice to watercress. Made in the UK. Perfect addition to a well used kitchen!